A primer on detecting indoor bioaerosols – microBEnet: the microbiology of the Built Environment network. One of the issues that was raised in the recent Microbiology of the Built Environment conference in Boulder was sampling, specifically what and how is the material collected for subsequent biological analysis. Industrial hygienists and those tackling questions of exposure have devoted a lot of time to developing methods for how to study the indoor environment, and if those methods are used, it would facilitate interpretation of results across disciplines. I was looking for a pithy review of issues in sampling, with the goal of finding an efficient way for an ecologist to get up-to-speed on methods commonly used for occupational hygiene purposes. I found it. It’s a chapter entitled Detection of indoor fungi bioaerosols, by James Scott, Richard Summerbell, and Brett Green, published in the book, Fundamentals of mold growth in indoor environments and strategies for healthy living (Wageningen Academic Publishers, 2011). They discuss fungi specifically, but the discussion is relevant for other microorganisms, too. The authors classify methods into two categories: (1) those that track particles in the air by directly sampling the air; and (2) those that look at growth directly on building materials. They discuss properties of particles that affect their movement, then talk about issues with active air sampling, passive air sampling, and lastly the analytical methods that can be applied to these samples. Interestingly, these sampling methods were developed with an eye toward the traditional analytic methods: culture, microscopes, or chemical markers. It will be interesting if the use of high-throughput PCR-based characterization of indoor environments alters recommended sampling protocols. Thanks, Rachel, for pointing to this excellent book. The book is well worth the investment for its many outstanding chapters. 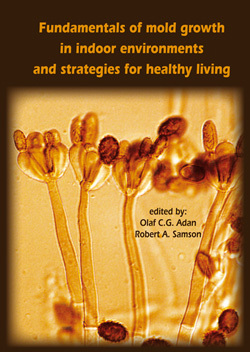 I often recommend that book for its Chapter 2, Water relations of fungi in indoor environments by Olaf Adan (one of the books co-editors), Henk Huinink, and Mirjam Bekker. There are many other valuable chapters, and the book has a non-nonsense approach with lots of useful material at both the basic (theory, principles, fundamental relationships) and applied (laboratory and field levels for researchers, professionals, and commercial interests). The Table of Contents can be viewed at http://www.wageningenacademic.com/_clientfiles/TOC/molds.pdf?sg=%7B734E90D3-9590-48E4-993E-913F0FFC1029%7D. It is available in hardcover or Kindle editions. For example … (http://www.amazon.com/s/ref=nb_sb_noss?url=search-alias%3Dstripbooks&field-keywords=Fundamentals+of+mold+growth&rh=n%3A283155%2Ck%3AFundamentals+of+mold+growth). For a reasonably well-reviewed American perspective, I also suggest consulting Chapter 11, Sampling Methods, in “Recognition, Evaluation, and Control of Indoor Mold,” (2008) edited by Prezant, Weekes, and Miller. Fairfax, VA: American Industrial Hygiene Association. http://books.google.com/books?id=WC4TnwEACAAJ&dq=editions:uwB02RIJ05QC&hl=en&sa=X&ei=iNigU-jKBMn5oASm-oDgCQ&ved=0CCEQ6AEwAQ. Yes, both books are indispensable in resolving issues and giving both academic & practical guidance on microbial matters in the indoor environment. Since buying a copy of the Adan & Samson book at the 2012 Mycotoxin Forum in Rotterdam, it has not left my desk except to be referenced. Rachel’s comment on the influence that DNA methods is having on our industry is so appropriate. I also recommend “Sampling and analysis of indoor microorganisms” Eds. Yang & Heinsohn, John Wiley &Sons 2007. A lot of knowledge gathered on natural history and growth requirements of common indoor microbes, mainly moulds. It also includes a very interesting chapter (nr 11) on forensics: niche colonization, succession, and ecology of indicator species.